The splendid Anura Vineyards in the foothills of the Simonsburg Mountains are renowned for their wide range of cultivars and fine wines. After a year’s break, many were pleased to learn that the estate would again host the popular Chocolate Festival. The event wasn’t just for chocoholics – who were amply provided for by an array of artisanal chocolatiers – but there were also ice cream vendors, gin and wine tastings, craft breweries, food stalls and live music available for the guests. The theme for 2018 was inspired by Willy Wonka, and The Events Draping Co. team created a striking candy stripe effect for client Cozi Hiring by draping the roof and sides of their marquee in bright red strips. 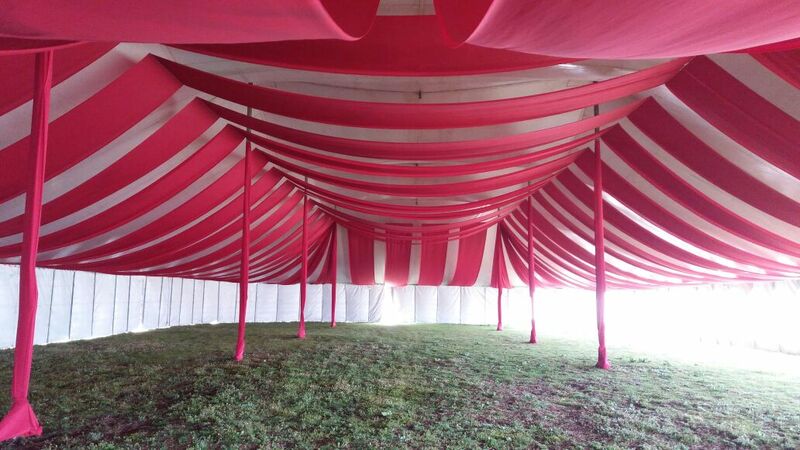 They completed the look by draping the marquee legs in the same red fabric. All that was needed was the chocolate fountain!